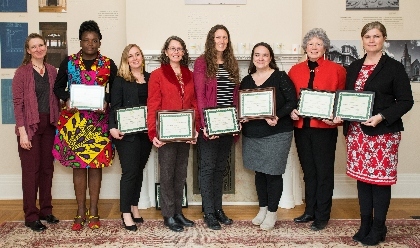 The Office of Community-University Partnerships & Service-Learning is delighted to announce our award winners for 2019. This year's award winners demonstrated not only the commitment to meaningful, commnuity-engaged experiences typical of past award winners, but also the importance of community and cross-college collaborations. Read more about all the awardees here. UVM is a Carnegie Classified Community-Engaged Institution, with partnerships in Burlington and around the world. Service-learning has a distinguished history at the University of Vermont. Home and alma mater of John Dewey, the progressive educator, UVM has long valued engagement in community and experiential education as key foundations for citizenship. Dewey saw education as the process of actively connecting experience to knowledge through engagement in and reflection on the world outside the classroom. Combining this view of education with the land-grant mission's commitment to Vermont, UVM opned the first named service-learning center in the nation in 1970. Today, community engagement continues throughout the institution, and the academic service-learning program remains strong. The CUPS office trains faculty in the pedagogy and practice of service-learning, helping to provide students with access to over 100 service-learning courses a year - more than most of our peer institutions. These courses partner with over 200 organizations every year, and our students offer technical, logistical, educational, design and clinical support, applying the tools of their discipline to concrete and real issues. The CUPS office maintains relationships with our community partners, and supports students to continue engaging in communities throughout their time at UVM. As a result of our collaborative work, UVM is in the top rankings as provider schools for CityYear, Teach for America and the Peace Corps. UVM Extension reaches into every corner of Vermont, and our faculty serve the state - and the world. Our alumni demonstrate that they have truly been prepared for lives of public service. In the special report below, read more about the contributions of UVM to the state of Vermont - and the world. In a classroom in St. Lucia, Rachel Benjamin figured out she had a passion for working with young people.